Those days California welcome Desert X Art Festival where the experts demonstrate modern design solutions for nowadays problems. Starting from February 25th the Coachella Valley, which is also famous for its music festivals, turned into a great "canvas" on which the artists "paint" incredible installations. One of them - Mirage- is entirely covered in mirrored panels, inside and out, creating a mirage-like appearance of vanishing in surrounding landscape. This year Desert X themes are different: designers, artists and architects present their personal vision of solving global problems like climate change. Visitors are offered to reflect over the serious through the prism of creativity. Mirage home disappears in the valley, despite it is located in its very heart. The design of the building recall a classical American ranch, inside and outside its surfaces covered in mirrored panel. Thanks to this design solution, the building as if merges with the surrounding landscape. Doug Aitken, the author of this piece of art admitted that he was inspired by the work of the architect Frank Lloyd Wrigh. 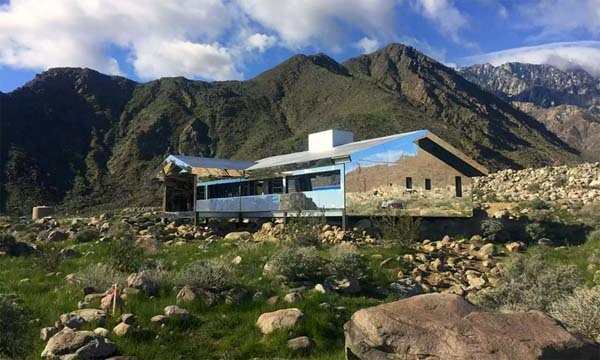 Aitken says that the idea of his house is to remind that modern housings are built in typical style and gained its popularity after the Second World War, so the idea is to keep humanity the "western landscape ", which is reflected in the mirror walls of the ranch.